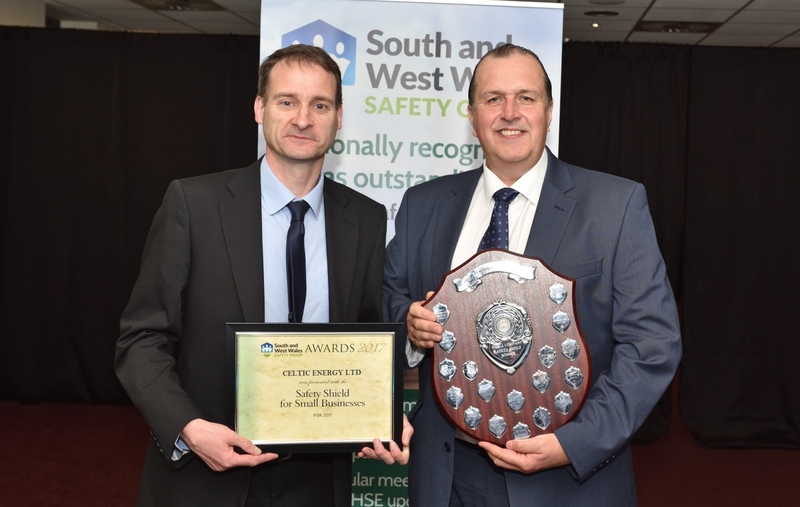 Following Celtic Energy’s success at the 2017 South & West Wales Safety Awards dinner in May 2018, the regional Safety Group chairman encouraged us to apply for the national awards. 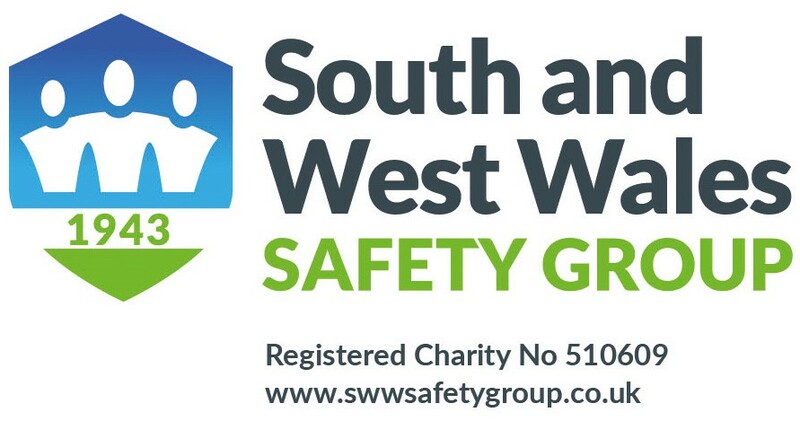 Our submission for the SGUK Innovation Awards 2018 was based around our approach and strategy for improving Health & Safety in our workplaces with practical examples of initiatives that have either made a positive difference or were under trial in an attempt to make a positive difference to the safety culture and safety record within the business. These ranged from the development of illuminated buggy-whips to easy-on-the-eye safety pamphlets to trialling undefeatable seat-belts and in-cab cameras along with engagement with industry groups to produce good-practice guidance for the wider minerals and extractive industries. 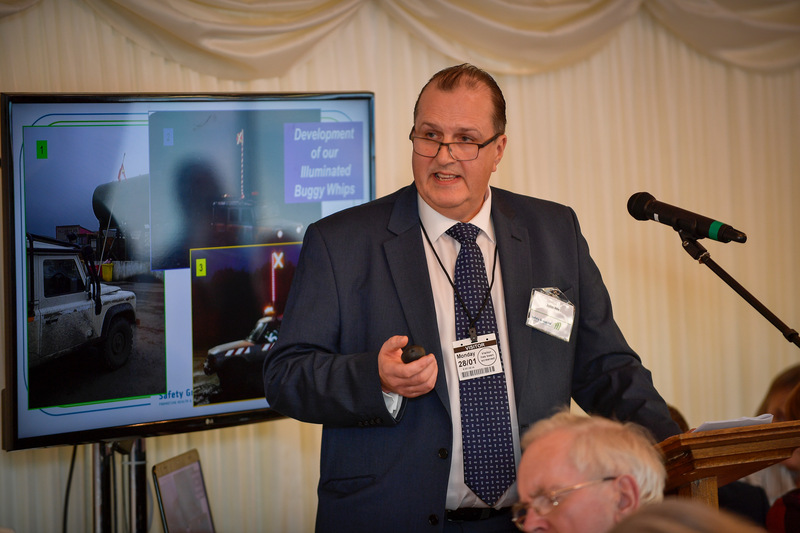 After presenting our submission at the RoSPA HQ in Birmingham in early December 2018, we were shortlisted for a top three prize to be presented at a prestigious luncheon at the House of Lords in January 2019, hosted by the SGUK president, Lord Brougham & Vaux CBE. The event was attended by Will Watson our CEO, Rob Thompson our Operations Director, Keith Jones our General Manager at Onllwyn Washery and John Rees our H&S Manager who gave a summary presentation of the submission to the assembled guests. Celtic Energy were awarded the SGUK Innovation Award 2nd prize of the ?Scottish Chamber of Safety? Silver Punch bowl which was presented by Lord Cullen. 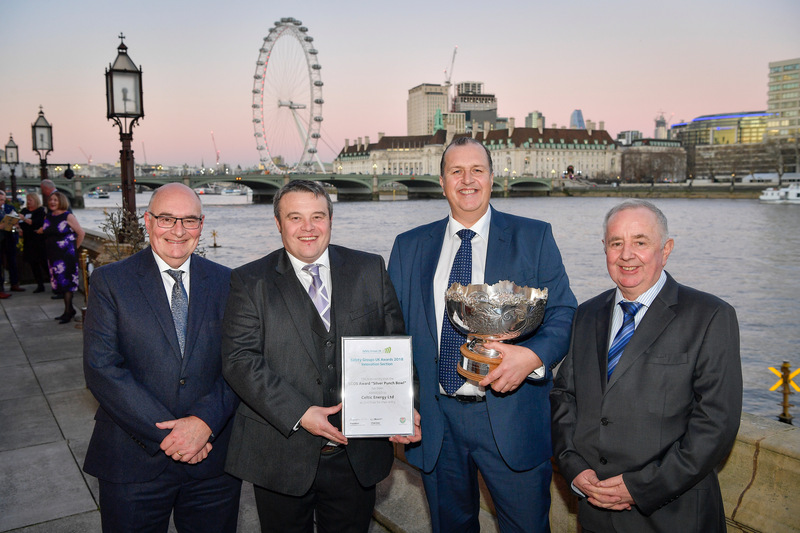 It is a significant achievement which represents both recognition and approval at a national level by Health & Safety professionals from a variety of backgrounds of the work we are doing here at Celtic Energy. The day included a tour of the Houses of Parliament and overall was an excellent experience for the many people who had travelled from all over the UK to attend plus the event gave a boost and added some sparkle to the Health & Safety sector across the country. 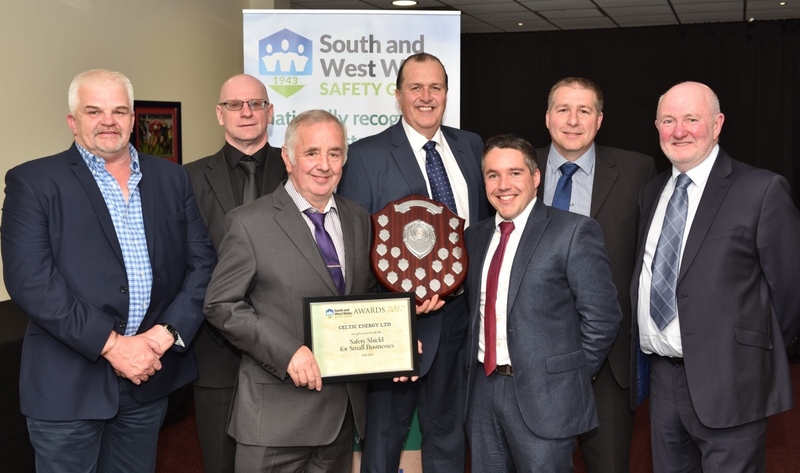 Representatives of Celtic Energy Ltd attended the 2017 Safety Awards Dinner at Parc-y-Scarlets on 11th May 2018, hosted by the South and West Wales Safety Group. It was supported by the Lord Mayor of Swansea with the awards being presented by Paul Kloss who is ?Acting Head of the HSE Field Operations Directorate for Wales & The Marches.? The Safety Shield [ Small & Medium Businesses ]. The shield was awarded for the Company?s work on innovative and effective work in the areas of ADT ( Articulated Dumptruck ) safety, pedestrian safety, electrical lock-off and seat belts. 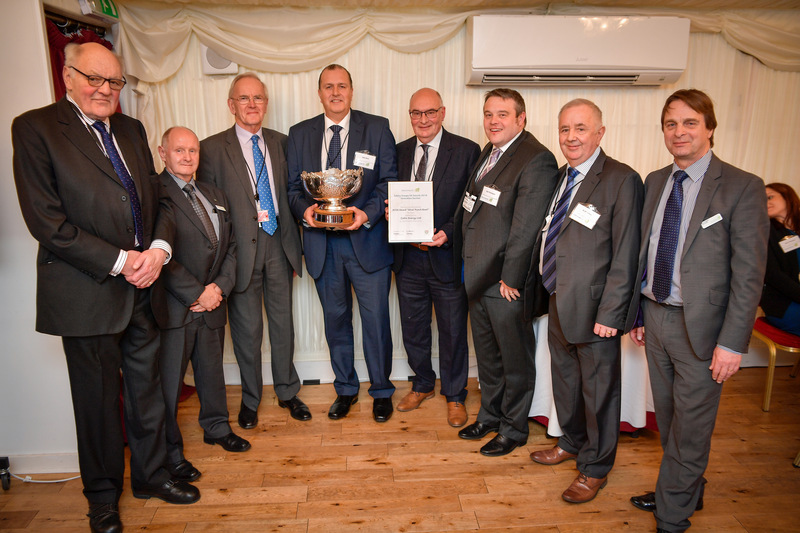 It also recognised the collaborative and interactive work carried out by Celtic Energy with various industry colleagues such as the HSE, QNJAC ( Quarries National Joint Advisory Committee ), the Institute of Quarrying and Coal-Imp. 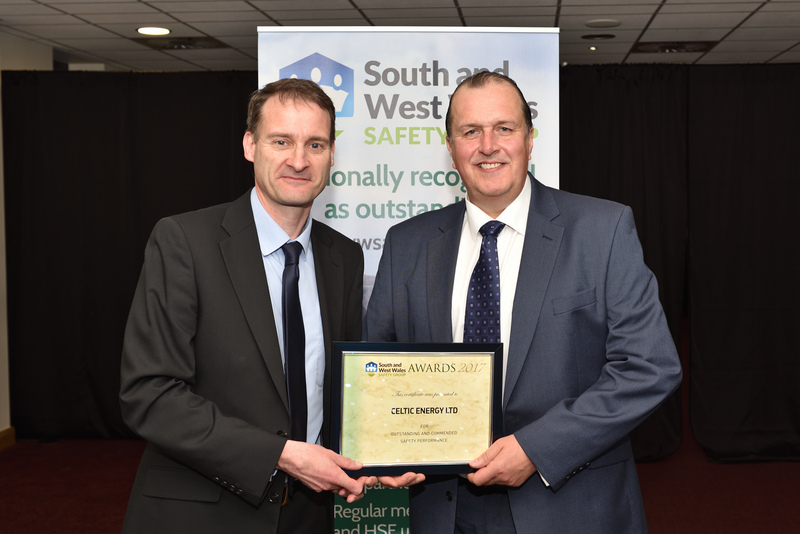 Celtic Energy are very pleased to have received such recognition for their efforts in the field of Health and Safety at Work. Site Management and Celtic Energy H&S Manager organised a number of Conveyor Safety Training sessions at Onllwyn Washery in November 2015 using the HSE? “Nip-point Demonstrator” machine as its centre-piece, which was loaned out to Celtic Energy by Rema Tip-Top UK. It proved to be a very effective way of demonstrating how there is no time and no way to escape from a running nip-point on a conveyor. As can be seen, the demo conveyor is relatively small compared with any on-site conveyor, yet has plenty of grip to pull & shock the sturdiest of operators pretty well off their feet. Each operator is invited to take hold of the handle of a bar which extends into the machine at the end of which is a flat paddle representing someone’s hand or glove. The conveyor loop is started up and the operator attempts to gently push the paddle towards the running nip-point and then retrieve the paddle from the nip point as it starts to bite. It soon becomes clear that no-one can beat-the-bite and everyone is drawn forward with quite a jolt before the conveyor automatically trips-out, leaving each operator more than a little stunned at the ferocity and speed of the bite. 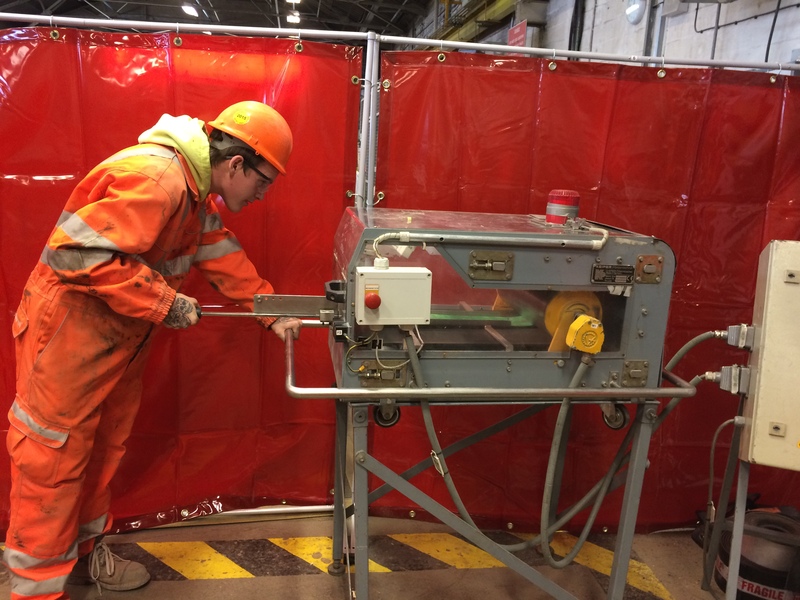 The sessions were delivered by Onllwyn Site Management, accompanied by a toolbox talk on conveyor safety procedures including the importance of effective guarding, electrical isolation and a few cases of where persons have suffered nasty injuries from conveyors. The combination of practical demonstration, gruesome injury examples and solid safety advice certainly seemed to hit home with the people involved and hopefully sets a lasting image with them. Thanks to Onllwyn Site Management and Richard Solly of Rema Tip-Top for enabling such an effective series of safety training sessions. After 4 years as an apprentice at Onllwyn DC and studying at Neath College, Nathan Cornelius has succesfully completed his NVQ Level 3 ONC in Electrical Engineering. 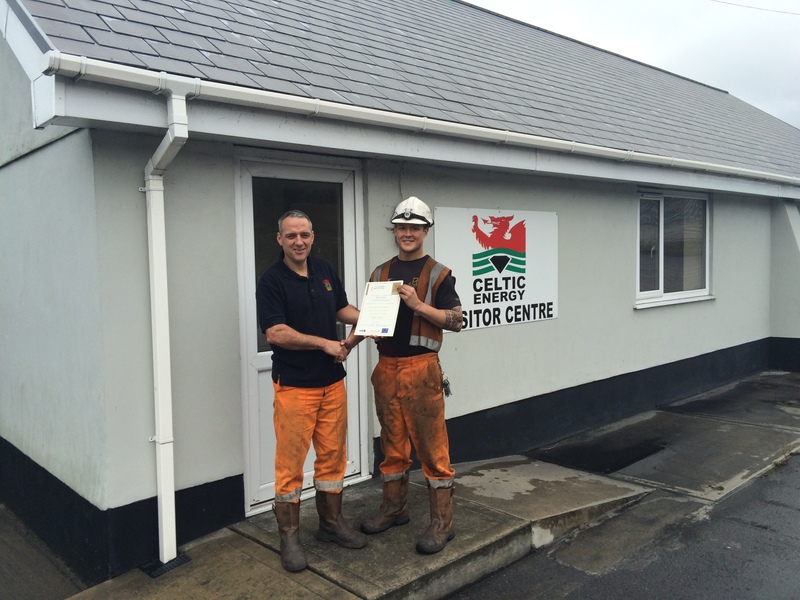 Onllwyn DC Operations Manager Paul Davies is seen presenting Nathan with his Certificate. Aled Lewis of Selar Opencast site is to compete in the annual “Wiggle Dragon Ride” , (road cycling) challenge on the 7th of June 2015. Aled is looking to complete a 226km ride through the Brecon Beacons to raise money for Macmillan Cancer Support. At the turn of the century, a time when “sportives” did not exist on British shores, a small collection of 270 cyclists braved the fearsome, yet stunning terrain of the South Wales Mountains to complete an epic 226km ride; unbeknownst to them this journey would become a world renowned cycling challenge, the Wiggle Dragon Ride. 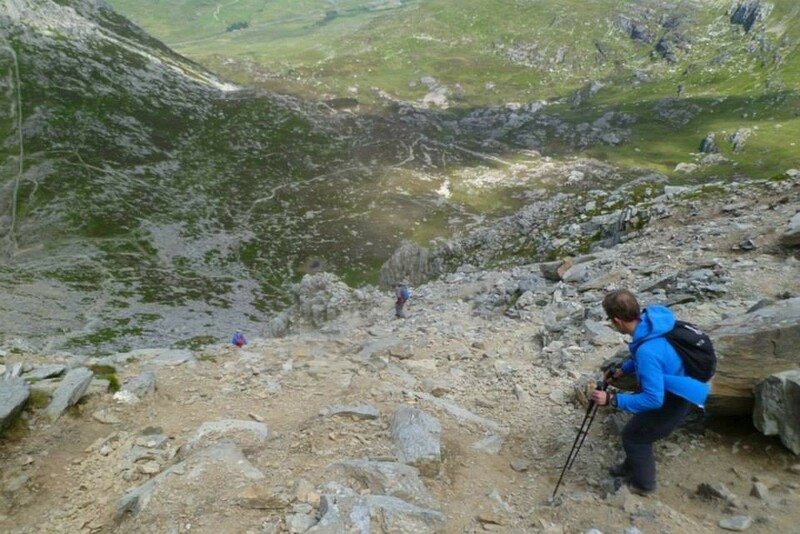 The group were faced with some of the country’s most testing climbs including the ‘Rhigos’, ‘Black Mountain’ and ‘Devil’s Elbow’ and working together they conquered everything in their path, returning home in glory. Each cyclist was hailed a hero and became part of cycling legend. For over a decade thousands of cyclists from over thirty countries around the world have journeyed to South Wales to cycle in the tracks of these brave pioneers; their goal, to claim that they too have “slayed the Dragon”. It is now said that for one to become a “true sportive rider” one must have completed this famous ride; with its long and relentless alpine-like climbs it’s one of the UK’s toughest and most rewarding cycling challenges and a “bucket-list” event for cyclists across the globe. Good luck to Aled from all at Celtic Energy and we look forward to a review after the event. This table was manufactured from two lumps of the finest Welsh Anthracite taken from the 9ft seam at Nant Helen opencast site. The 9ft seam is primarily used to produce our Premium Black Diamond domestic products. Having been approached by Mark, of Grants Marble we identified the quality required which he then had to grind, shape, polish, join the two lumps together, cut the top platform flat and give it a final polish. 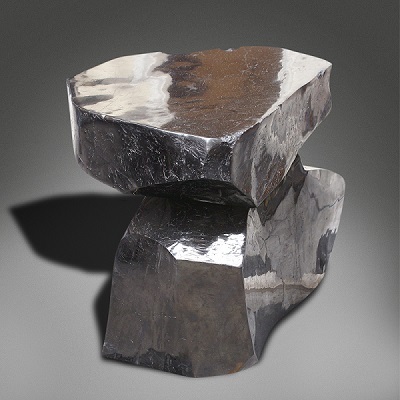 The final result being a unique piece of modern furniture from material that is millions of years old. Link to revolving coal table below. In April Rhondda Cynon Taff CBC resolved to grant permission for a new site at Bryn Defaid near Llwydcoed Aberdare, subject to various conditions and a legal agreement. This will be the first new site that Celtic Energy have gained permission for since privatisation in 1994.The site will provide 1.2 Million tonnes of dry steam coal over a period of about 5 years. The site will provide 50 new jobs along with three apprenticeships and provide approximately £500,000 in community benefit. Part of the site is within the Aberdare Mountain Site of Importance for Nature Conservation (SINC) and as part of the restoration proposals a 25 year aftercare plan has been put forward. This will make sure that the area of SINC in Celtic Energy’s control is managed properly to help ensure successful restoration and long term nature conservation benefits. 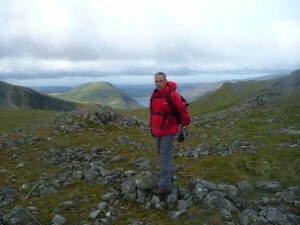 Onllwyn Distribution Centre, Operations Manager Paul Davies has succesfully completed the demanding Welsh 3000 Challenge. “I wanted to say a massive thank you for your support and added motivation to get this challenge done. It was without doubt a very hard day out and I was shocked at the terrain we had to cover to get at the Peaks. Looking back I think I enjoyed it, but I may be suffering from positive amnesia!! Started walking at 4.11am finished at 12.05am, Nearly 20 hours. Total mileage with 1st ascent and final descent was about 31 miles. Some pleasure involved. It is stunning up there and we was lucky to have lots of blue skies. 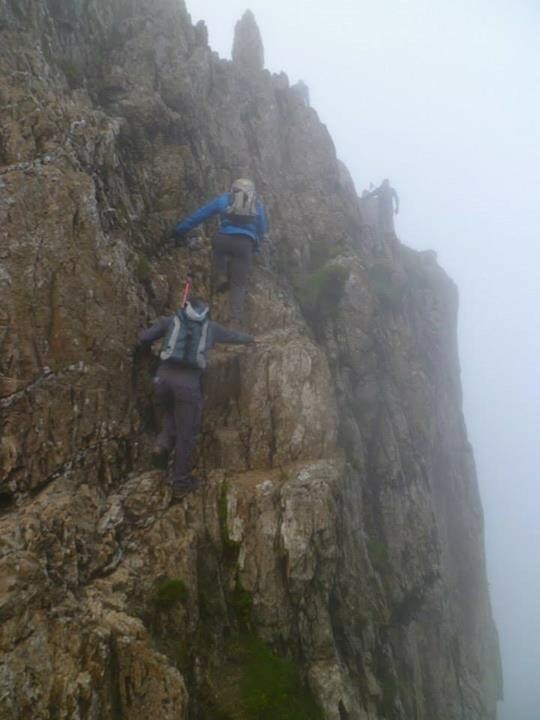 There was plenty of scrambling involved, that I found scary. Do not go if you are scared of heights. Tech heads have a look at the info/evidence recorded on my GPS watch. Again, A Big thank you to all that have donated to me and made it worthwhile, including the people who gave last year when it was cancelled due to gale force winds. I now understand why they had to cancel. Paul Davies, Operations Manager at Onllwyn DC is to participate in the Welsh 3000’s 24hr challenge on 21st June 2014 hoping to raise in excess of £2000 for Cancer Research UK. The total distance of the challenge is in excess of 30 miles with an ascent of over 4000 metres. The walk is also known as “The 14 Peaks” (although there are officially 15 peaks, or possibly 16). The company wish Paul all the best and will report on this challenge in due course.